Harrat Khaybar volcano one of Arabia's largest volcanic fields and covers more than 14,000 square km 65 km NE of Al Madinah (Medina) in western Saudi Arabia. It contains a 100 km long N-S oriented line of volcanic vents including scoria cones, lava domes, maars, basalt lava flows, and the only stratovolcano in the Harrats of western Arabia, Jabal Qidr stratovolcano. There are at least 8 lava flows that have been dated to historic times (less than 1500 years old). These include the prominent 55-km-long Habir lava flow and flows from Jabal Oidr. However, only one eruption is recorded in historic memory from early Mohammedan times during the 7th century AD. 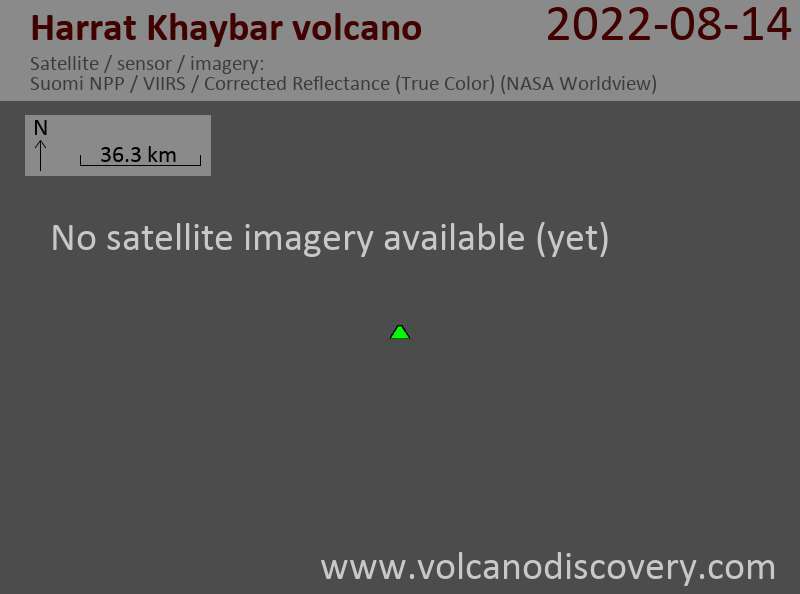 Khaybar is one of 3 coalesced basaltic lava fields, Harrats Khaybar, Ithnayn, and Kura, which constitute the largest contiguous area of Cenozoic basalt in Saudi Arabia, similar in extent (20,564 km2) and volume (1,850 km3) to Harrat Rahat, which is situated only 25 km to the south. The field contains 327 scoria cones, 46 basaltic shield volcanoes, 20 domes, 5 tuff cones, one basaltic stratovolcano (symmetrical Jebel Qidr) and 39 massive and very long "whale-back" lava flows. Lavas from the 5 million years-old Harrat Khaybar overlap the older lavas of Harrat Kura to the west and merge with lavas from Harrat Ithnayn to the north. The so-called "whale-back" lava flows are an unusual landform of coalesced lava shields forming above large tubes feeding long lava flows and are particularly common from the Harrats in western Arabia. The whaleback flows can be up to 20 km long, and form strings of open craters (skylights of the lava flows) abvoe the lava tunnel.